Hello Everyone! Thanks for reading on this lovely Monday! 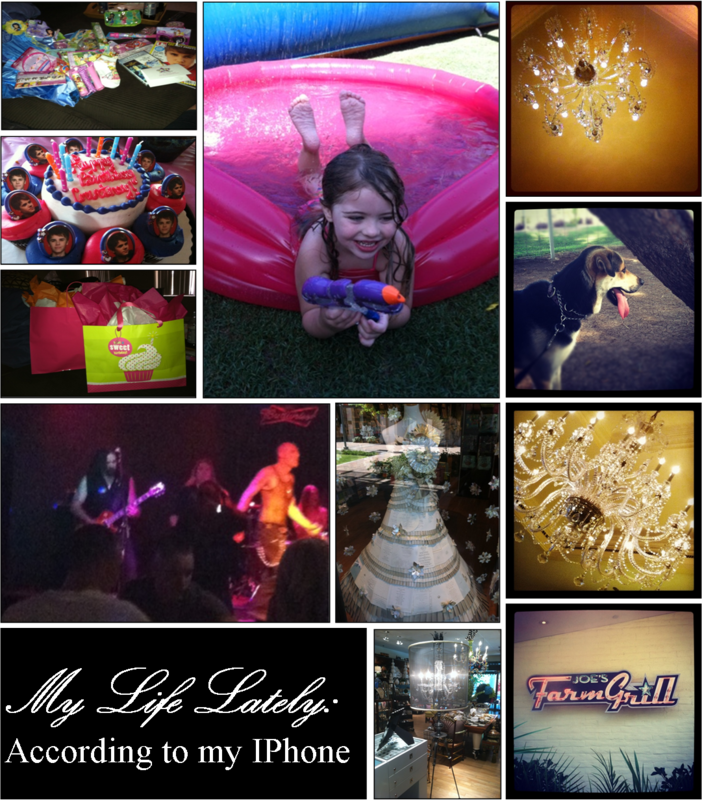 Not much to read today, just a little look at my life thanks to my IPhone. -My two little sisters had a combined birthday party, complete with blow up slide and mini pools. The cutest little nugget you’ve ever seen (along with all the other kids at the party) were armed and dangerous! I was soaked from their water guns within minutes. At the top you can see what I chose to purchase for a Bieber loving (see cake) 10 year old and a Tinkerbelle loving 3 year old. -Apparently I have been obsessing over chandeliers lately. These two reside at the Ritz Carlton Phoenix. -On Saturday, the boyfriend and I headed to the dog park with our little girl. She had a blast with all the pups and I fell in love with a pair of snorting bulldogs. The we headed down the street to Joe’s Farm Grill, for a dog-friendly, delicious breakfast. -Later that evening after a glorious midday nap, we went to my Uncle’s show. Yes, my uncle is a rock star (well I think he’s a star). He is the long haired BAMF on the left with the guitar. If you are into rock music (which I am generally not, but I make this exception) check out Dagger! -That horrible photo through a window is a wedding dress made entirely of invitations. You may not know this, but I dream of being a wedding and event planner. This dress made me feel whimsical and happy, so I had to share! -You can’t see it here, but this lamp is freaking sweet! Not $3000 sweet like the price tag implies, but it totally plays to my love of chandeliers! Alright loves, that’s all for now! Happiest of Mondays to you!